May 1, 2016 – For the first time, one of the new work platforms in High Bay 3 inside the Vehicle Assembly Building (VAB) at NASA’s Kennedy Space Center in Florida was powered on. Lights illuminate one half of the J-level platforms as the platform is extended. The J-level platforms are located about 112 feet above the floor, or nearly 11 stories high. A preliminary test of both J platforms was completed to verify each platform’s push chain system, roller system and electrical connections. The Ground Systems Development and Operations Program is overseeing upgrades and modifications to VAB High Bay 3 to support processing of the Space Launch System (SLS) and Orion spacecraft. 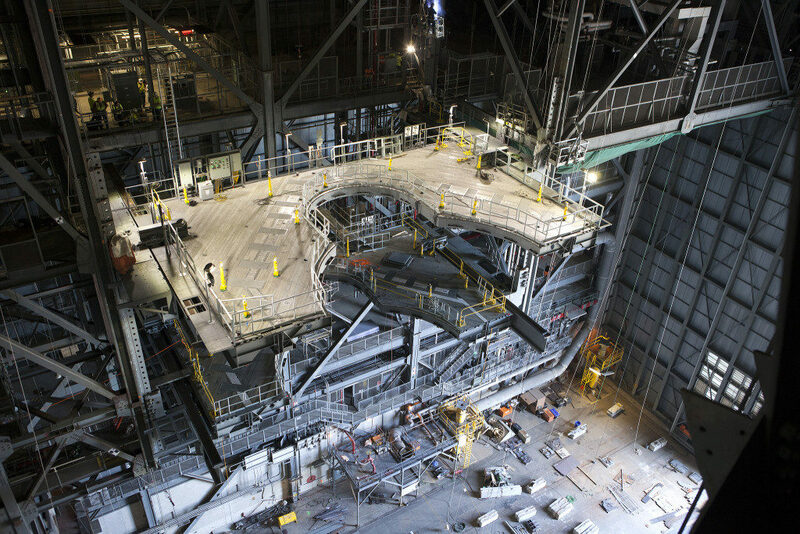 A total of 10 levels of new platforms, 20 platform halves altogether, will surround the SLS rocket and Orion spacecraft and provide access for testing and processing. In view below is the K-level platform.